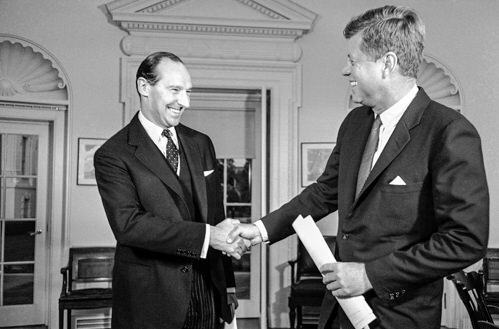 The new British Ambassador to the United States, Sir David Ormsby-Gore (Lord Harlech), presents his diplomatic credentials to John F. Kennedy in the Oval Office on 26 October 1961. Photo by Bob Schutz / Associated Press. Wilson had good reason to believe that he might become Britain’s next Prime Minister. He was in Washington for a 4-day visit to meet with Kennedy, senior administration officials, and leaders on the Hill. “There are a lot of things I want to ask the President and his colleagues about,” he told reporters soon after landing. “I want to listen as much as talk.” He was bringing with him, he said, a 14-point program outlining British government policy in the event that Labour won the coming election. And in emphasizing the similarities of his proposed program with American policy, Wilson hoped to return to London having created the impression that he had Kennedy’s endorsement.2 Wilson also planned to visit Moscow in May. Ormsby-Gore I just thought I would have a word with you before you see [Harold] Wilson. Ormsby-Gore One of the impressions he's got talking to Senators, and indeed some people in the administration, is that there's no enthusiasm for the Multilateral Force. Ormsby-Gore I don't know whether you want to correct that impression or leave him with it, but I thought you ought to know. Ormsby-Gore The other thing--that the impression he strongly got from talking to Senators is that any question of doing away with United States veto of the use of weapons in a Multilateral Force is really not a political possibility. JFK Yeah. Well, I think that's correct. JFK I don't think we ought to use the word "veto," but there should be unanimity on the firing. Or at least, the firing ought to include the United States, the decision to fire. JFK Well, then, I think we just have to--we just--it's just not a start. I mean, you can't have some Europeans who have got about three [nuclear] weapons deciding where we're going to fire everybody's. And I would think that they wouldn't want to be firing any weapons if the United States isn't going to fire its. JFK --so that the Euro--if we ever get the Germans in on it on the basis we're now talking about, surface ships and with an American acquiescence, and if they think that's going--it seems to me it's got some merit. JFK That's correct. I think they see it as that. But I think it really sticks it to the General [Charles de Gaulle]. If it fails, it's just going to play into the General's hands. JFK So, I'm going to give him a little ginger. I thought he had a good speech yesterday, because I thought it was--as a political speech it was good because it didn't have too much hot air in it. It had a lot of hot air in it, but it didn't look like hot air. Ormsby-Gore No. No, I--[both laugh]--No, I quite agree. I thought it was very sensible. JFK How is he with you? Ormsby-Gore Well, it's going all right. JFK Is he enjoying his visit? Ormsby-Gore You know, he looks pleased as punch because everybody photographs him the whole time. Ormsby-Gore Are extraordinarily close together on most things. JFK Huh? Sort of like Nelson Rockefeller, isn't it? Ormsby-Gore [laughs] On nuclear test ban, I think the Prime Minister will be coming back with another message in the next 24 hours or so. Ormsby-Gore He sent me a draft, and I have made some comments on it. So what he would hope is to get some agreement by the end of this week on what a joint message to [Nikita] K[hrushchev] would look like. Ormsby-Gore And then how we play the hand with that will take a little bit of time more. JFK Right. Right. I saw a British plane was fired on in the [Berlin] corridor, or right out of the corridor, a Cessna. Ormsby-Gore Oh, really? I haven't seen that. JFK In the--Berlin, but I guess it's moved out of the corridor a bit. Ormsby-Gore It was probably doing something silly. JFK I saw [Senator George] Smathers [Democrat, Florida] this morning. He was with his wife and son. I said, "Well, it just shows how lucky some guys are." [both laugh]. OK. But what are the--what other impression has he [Wilson] got that's--anything else that he ought to be--about Nassau? He hasn't got any impression that we are not for Nassau, has he? Ormsby-Gore --and he would do his best to see that some arrangement was made so that whatever the Polaris submarines being built were handed over for some other use, full stop. JFK Well, he may decide politically he doesn't want to quite go that hard, in my judgment, before he's finished. Ormsby-Gore I think that's very likely. JFK The national deterrent will . . . he may find himself in trouble on that one. Ormsby-Gore Yeah. On other things, I mean, I think he--you will find he agrees on most of these things: trade, the Kennedy Round, all that. Ormsby-Gore Of course, I think he's very optimistic about what might come out of the Kennedy Round. I mean, our reports from Paris are pretty gloomy. Ormsby-Gore Yeah. See, he could easily wreck that round if he wants to. Ormsby-Gore And then by mid-summer next year, I don't know what it will look like, the sort of forward policy. I mean, you can't get any reduction in trade barriers. The agriculture services is all building up, and everyone's getting really angry with each other. Ormsby-Gore We might be in quite a mess. Ormsby-Gore He--Harold Wilson happily goes on and thinks, you see, there will be a great conference at which all these trade barriers will come down and you will all allow in lots of raw materials and temporary foodstuffs from the Commonwealth and the under-developed countries. Ormsby-Gore It's a nice picture, but I don't see it happening with the Six. JFK Yeah. Yeah. Yeah. OK.
And it turned out that Wilson’s confidence was well-founded. The Labour Party swept to victory on October 15, 1964. Dictabelt 17A.2, Presidential Recordings Collection, President’s Office Files, John F. Kennedy Library. Transcript by David Coleman. 1. Wilson did indeed become Prime Minister for what became the first of two separate stints as Prime Minister when when Labour won the election on 15 October 1964. 2. “Labor’s Wilson Here for Talks,” Washington Post, 30 March 1963; David Lawrence, “A Danger in Meeting of Wilson and Kennedy,” Los Angeles Times, 2 April 1963. 3. Sydney Gruson, “Harold Wilson: Lucky and Skillful,” New York Times, 30 March 1963. 4. Philip Geyelin, “Britain’s Wilson,” Wall Street Journal, 2 April 1963. 5. Editorial, “Leader of the Opposition,” New York Times, 2 April 1963. 6. E.W. Kenworthy, “Wilson Backs U.S. on NATO, But Favors Changes in Policy,” New York Times, 1 April 1963. 7. E.W. Kenworthy, “Wilson Backs U.S. on NATO, But Favors Changes in Policy,” New York Times, 1 April 1963; Murrey Marder, “Labor Party’s Wilson Opens Talks Here,” Washington Post, 31 March 1963. 8. E.W. Kenworthy, “Wilson Backs U.S. on NATO, But Favors Changes in Policy,” New York Times, 1 April 1963; Murrey Marder, “Labor Party’s Wilson Opens Talks Here,” Washington Post, 31 March 1963. 9. Philip Geyelin, “Britain’s Wilson,” Wall Street Journal, 2 April 1963; Sydney Gruson, “Harold Wilson: Lucky and Skillful,” New York Times, 30 March 1963; Editorial, “Leader of the Opposition,” New York Times, 2 April 1963. 10. Nelson Rockefeller was the Governor of New York and been considered the front-runner for the Republican nomination for the 1964 presidential contest until, a year after his own divorce, he married another divocee. He had generally staked moderate positions on many issues that did not contrast strongly with Kennedy’s own. 11. Smathers was a close friend of Kennedy’s. Ormsby-Gore probably came to know Smathers well from his visits to Palm Beach with Kennedy. 12. The Kennedy Round was the name given to the sixth session of the General Agreement on Tariffs and Trade (GATT) trade negotiations. The Kennedy Round negotiations didn’t officialy begin until May 1964 in Geneva, but advance negotiations on mutual tariff reductions had begun in Paris after the passage of the U.S. Trade Expansion Act in 1962. Edwin L. Dale, Jr, “Paris-Bonn Pact to Ask U.S. Cuts in Major Tariffs,” New York Times, 29 March 1963. 13. Quoted in “Wilson, Kennedy Hold Economic Defense Talk,” Los Angeles Times, 3 April 1963.